Powerful. Wireless. Water-resistant. Introducing Big Blue Party™, the latest—and loudest—addition to the Big Blue Audio® Family. 4 full-range speaker drivers deliver powerful 360° sound. Take it anywhere—poolside, decks or even the beach. Connects wirelessly to Bluetooth® devices up to 33‘ away. Rechargeable battery lasts more than 4.5 hours per charge. Easy-grip carry handle, measures 6.3"w x 6.3"d x 15.8"h.
So loud, the neighbors won‘t have to call the cops. 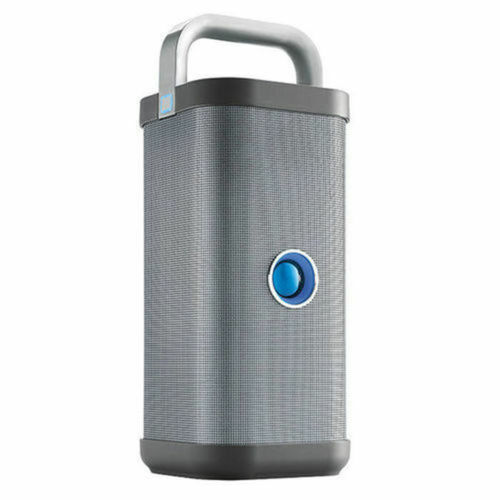 With its four specially angled speaker drivers, this 72-watt indoor-outdoor speaker surrounds your party in omnidirectional, full-range stereo–complete with thundering bass from the subwoofer and passive radiator. Control it from your device or the top-mounted bass/treble and volume controls. With a water-resistant exterior, easy-grip carry handle and a rechargeable battery, you can party just about anywhere. The top-mounted bass/treble and volume controls allow easy adjustment. When it’s time to recharge, the included AC adapter works with any standard outlet. So you can take your music where the fun is. Just power on Big Blue Party, hold down the pairing button, to begin streaming tunes from Bluetooth® devices like smartphones and tablets. Or simply touch it to your NFC device for instant wireless pairing!